Summary: It has a lovely, literary feeling, but its strengths are also its weaknesses. The backstory drags, and younger children may find it confusing. Despereaux Tilling (Broderick) is a highly unusual mouse. Tiny, with enormous ears, he is the bane of his parents’ existence. He doesn’t behave like a mouse. He doesn’t scurry, he isn’t timid; and when his brother takes him to the castle library to eat paper, he starts reading the books instead. Despereaux is a romantic, full of tales of courtly love and knightly derring-do, he longs to save a damsel in distress, and sets his heart on the princess, Pea (Watson). 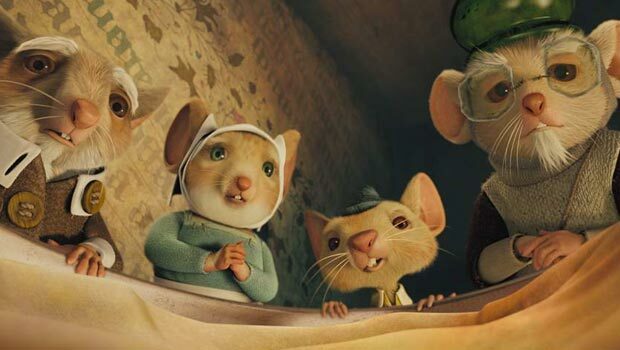 The Tale of Despereaux, based on Kate DiCamillo’s Newbery winning fable, sticks closely to the source material in both look and story. The animation is old-fashioned, with a light, watercolour wash that suits the story’s themes right down to the ground. The voice actors are uniformly good, with Sigourney Weaver’s narrator standing out. DiCamillo obviously has an issue with parents: Despereaux’s are pretty useless, and see him banished with barely a qualm, while the king sulks, playing the lute in the throne room, failing miserably in his duty or to see that he is destroying his whole country. And then there’s Gregory (Coltrane), the jailer, who long ago abandoned his baby daughter and refuses to discuss his past. The older generation having failed them, it’s up to the kids to save the country and bring light, life, and soup back to Dor. This message of courage and pluckiness in the face of adversity will sit well with children, if they can get over the other. It has a lovely, literary feeling, but its strengths are also its weaknesses. The backstory drags, and younger children may find it confusing. But more importantly, it’s surprisingly dark. The idea of grief and depression affecting an entire country; Despereaux’ banishment to Ratworld; the kidnapping of Pea; the sadness of Miggery Sow (Ullman), the orphaned serving girl who dreams of becoming a princess – all these elements combined may be too much for the target audience, while the multiple story strands become quite confusing if you are unfamiliar with the source material.